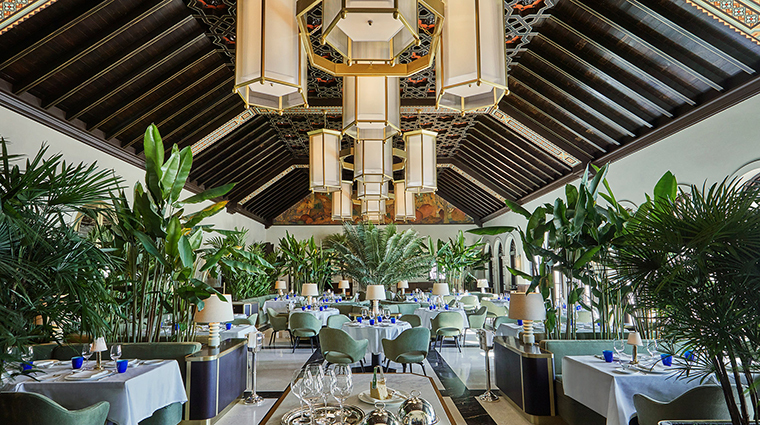 Four Seasons Hotel at The Surf Club opened in early 2017, breathing new life into the fabled members-only beachfront club, and at its heart is Le Sirenuse Miami and its champagne bar. Le Sirenuse hotel is an Amalfi Coast mainstay. This “first-class hotel, spotless and cool,” as John Steinbeck described it in 1953, is the site of the heralded La Sponda. 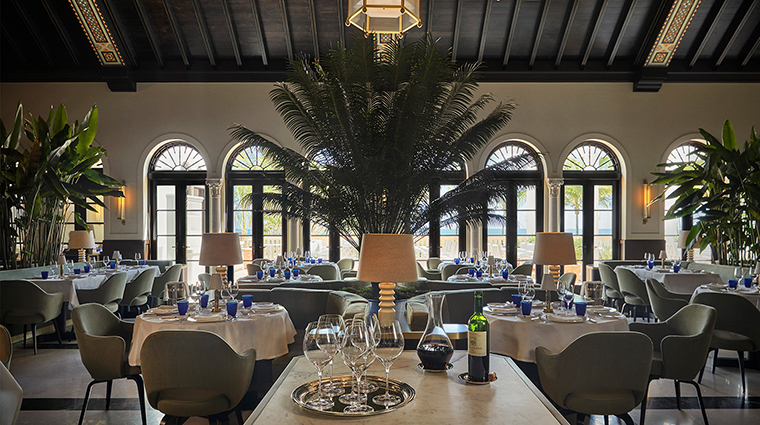 Now, the famed restaurant is making its first foray outside of Positano, Italy, within the newly renovated Surfside hotel. The U.S. outpost on the Atlantic Coast brings with it the same warmth and hospitality and taste of Southern Italy that the Amalfi Coast exudes. 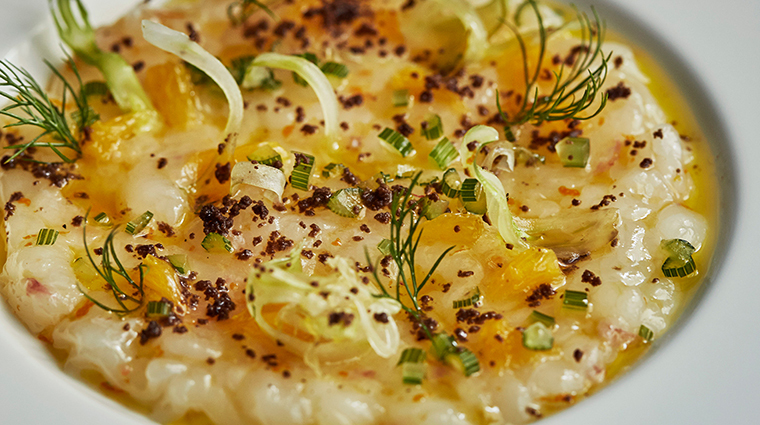 At the helm of Le Sirenuse is chef de cuisine Antonio Mermolia, who hails from Calabria. 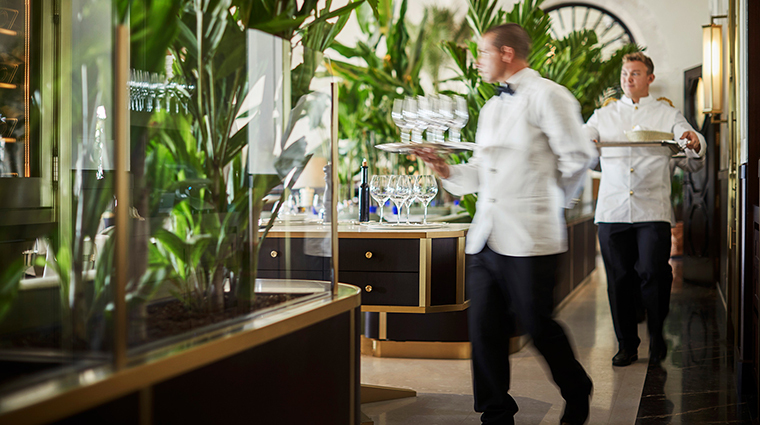 You’ll find Le Sirenuse along the revitalized private club’s legendary “Peacock Alley” — in the former ballroom once host to lavish black-tie galas and over-the-top parties that were the talk of the town. Take note of the intricately designed ceilings, ornate fireplaces and life-sized murals above and mammoth restored to their original grandeur. Parisian interior designer Joseph Dirand finds inspiration in the nine acres of sandy beaches and sparkling Atlantic — you will, too, when you see the beachcomber green and creamy magnolia palette and mahogany elements. At the Surfside restaurant, it’s all in the details. Those familiar with La Sponda will recognize the plush moss couches, verdant pot plants, candlelit ambient lighting and Carlo Moretti glassware. 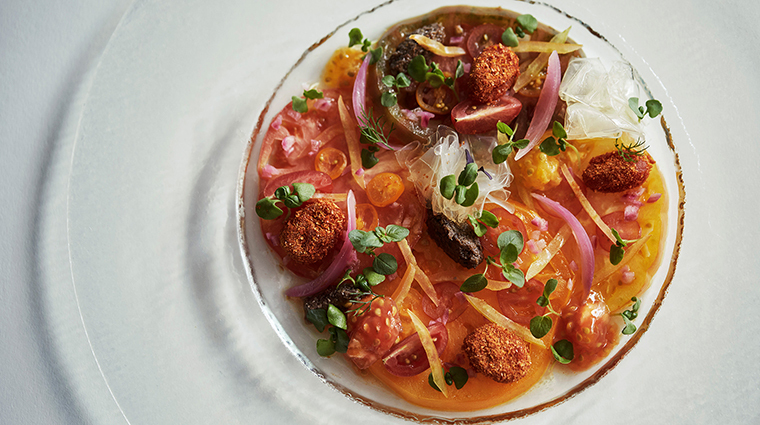 Le Sirenuse is Mediterranean fare at its finest. Whenever you dine at this Miami Beach restaurant, you can look forward to a menu filled with carefully sourced ingredients from the homeland. Pomodorino heirloom tomatoes are cultivated from the lower slopes of Mount Vesuvius and Arborio risotto rice harvested in Po Valley plain. Ask to sit outside. 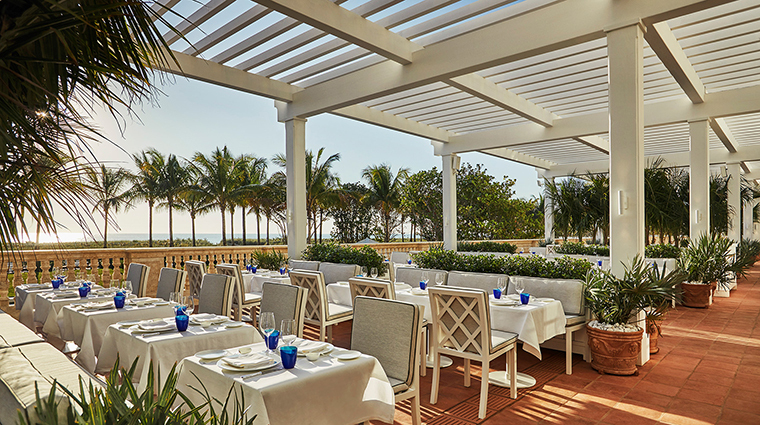 Whether breakfast, lunch or dinner, you can’t go wrong with a seat out on the cool, pergola-shaded oceanfront terrace. 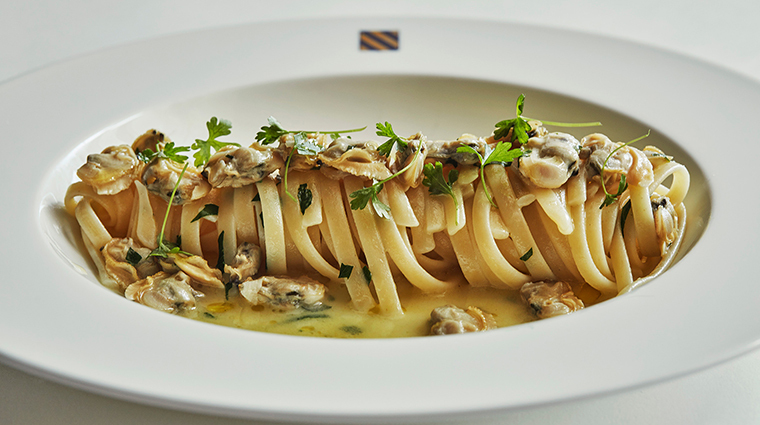 That linguine alle vongole (with clams) somehow tastes all the better sitting seaside. The Sersale family behind Positano’s Le Sirenuse is very much involved here. There’s a reason it chose Four Seasons at Surf Club as the place to grow. There’s no better seal of approval than that. 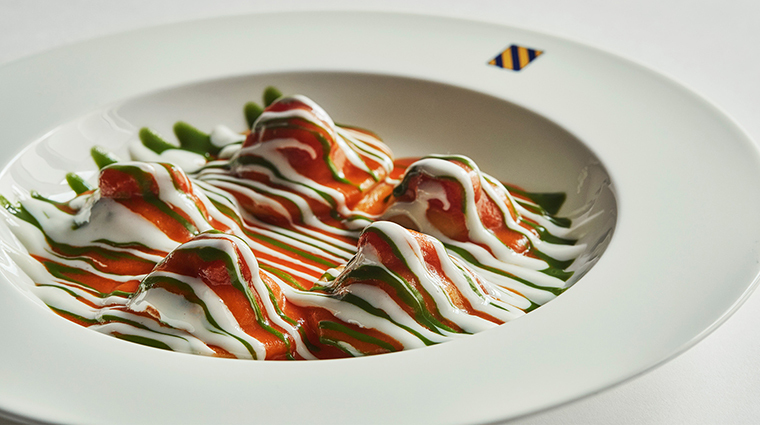 Room service is by Four Season executive chef Jose Gamez, so if it’s Le Sirenuse you want, head downstairs to eat. The Italian restaurant seats 90 guests inside and 70 diners outdoors on the oceanfront patio. There’s a private dining room for 12 people, book it for a special occasion. Chef de cuisine Antonio Mermolia spent a summer training in La Sponda’s kitchen, perfecting the time-honored Southern Italian cuisine, culture and service. The Calabrese chef learned his craft at his family’s boutique hotel in Calabria, Hotel Villa Calliope, and at 16 started apprenticeships at top European hotels before opening his own restaurant in Sicily. He’s the real deal. Mermolia won accolades from New York’s Il Punto (owner Tony Pecora discovered him at his family’s place) and Mulino a Vino, and his own Capatosta in Manhattan’s Flatiron District. 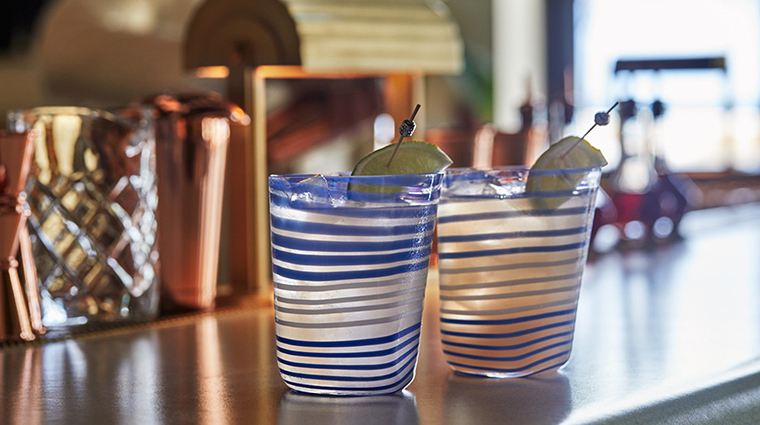 As in Positano, Champagne Bar drinks are served in handmade, blue Venetian glassware by Carlo Moretti. Try the Surf Club Mangreva, a liquid Key lime pie with apply brandy, rum, fresh lemon and lime, coconut milk and honey. The Mangreva mix is available bottled up in the room’s mini-bar. The bar boasts Miami’s most extensive collection of champagnes with 120-plus varieties. Chat it up bar manager Jon Curiel, and he’ll gladly make a recommendation. The cocktails pay homage to the Surf Club’s heritage, historic guests and Italy. Three to try: Venice through Miami (because it’s Miami) for a summery, light and refreshing tipple made with aperol, coconut water and peach liqueur; the Elizabeth Taylor, a sophisticated sip with Ruinart Blanc de Blancs Brut Champagne; and the Surf Club Sling with Beefeater Gin and Dolin Dry Vermouth.